Winter has (thankfully) run its course in Columbus. As the snappy spring days turn into summer’s warm embrace, many a trails are waiting to be trodden. Here are some ideal summer hikes for those ready to swap the sweaters for hiking boots and explore Greater Columbus&apos; parks. You don’t have to venture too far from downtown Columbus to encounter ample outdoor recreation opportunities. Scioto Audubon Metro Park sits alongside the Scioto River, making it a great place to launch a kayak, fish from the banks, or hike the Hermit Thrush Trail. This park also includes a boardwalk that connects to the half-mile Wetland Trail. 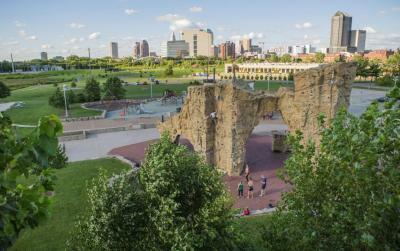 Scioto Audubon features an obstacle-course, climbing wall, nature center, dog park and volleyball courts. 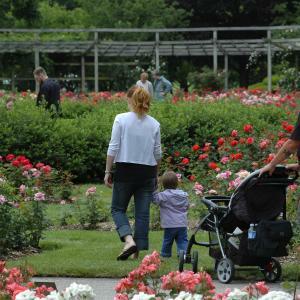 Early summer is the best time to explore one of the largest rose gardens in the country. Hues of pinks and reds dot the labyrinth of over 11,000 roses made up of 350 varieties. Roses will be in full bloom late-May to late-June. Meander the garden’s thirteen acres or use the Park of Roses as a starting point on your journey north or south along the Olentangy Trail. The newest of the Columbus and Franklin County Metro Parks sits along the Scioto River just ten minutes south of the city. This park features over seven miles of trails and views of the river along the REI River Trail (1.8 miles). Walk along the river and end the loop on the scenic bluffs overlooking the park for more miles logged. Water sport enthusiasts can launch kayaks or canoes from the north end of the park and paddle three miles to the south river access point. Scioto Grove also offers five backpacking sites, an archery range and pet-friendly trails. A long winter indoors warrants time spent in the fields of Prairie Oaks Metro Park. Pet parents can let the pups take a dip in the Darby Bend Lake or explore the natural play area surrounding Beaver Lake for a relaxing 1-2 mile hike. 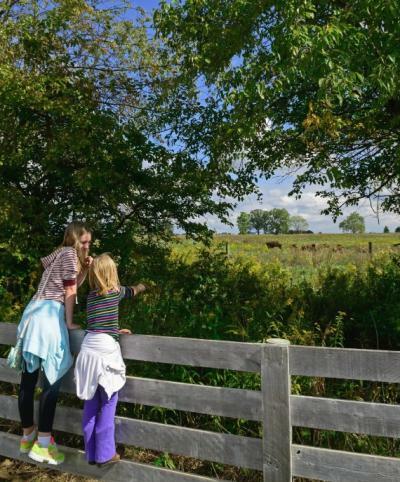 Utilize a sunny day and stroll through pastures adjacent to the Big Darby Creek along the 3 mile Coneflower Trail. As the largest Metro Park, Battelle Darby Creek offers endless ways to stretch your winter legs. Meander along the Big and Little Darby Creeks (both of which are National Scenic Rivers) on the 2-mile Terrace Trail or start at the interactive nature center and putter past the bison pastures for a flat and easy out and back hike on the Darby Creek Greenway. This park has more than 20 miles of trails, an ideal outing for long-distance hikers or trail runners. Clear Creek is the farthest Metro Park from downtown Columbus (45 minutes) but worth the drive. Its location in the Appalachian foothills makes for steep but spectacular hiking. The Cemetery Ridge trail (2.5 miles) gets the hiker’s heart racing as it quickly ascends hundreds of feet. Wind through forest and prairie before connecting to the Hemlock Trail for a much-welcome 1.5 mile return descent through mature hemlocks and white pines. As the Convention Services Assistant at Experience Columbus, Hannah provides guests and convention attendees with promotional materials to generate a memorable visit in Columbus. Hannah is a lifelong Columbus native, and loves the accessible yet affordable energy of her home city. In her spare time she can be found exercising around her Victorian Village neighborhood, experimenting with farmers market fresh produce in her kitchen, or exploring the multitude of Columbus’ dining options. 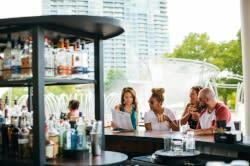 Favorites include veggie sandwiches at Brown Bag Deli in German Village, seasonal tapas at Basi Italia in the Short North, and tacos at 4th Street’s El Camino.